I wanted to do this shot with Glass bottles but it is so hard to get Glass Pepsi bottles as apparently they are distributed in Mexico, and only a few places in US. This is the second in a series I will do on this type of theme, just because I love how basic it is and easy to produce. You can add whatever caption you want and do it with virtually any product. 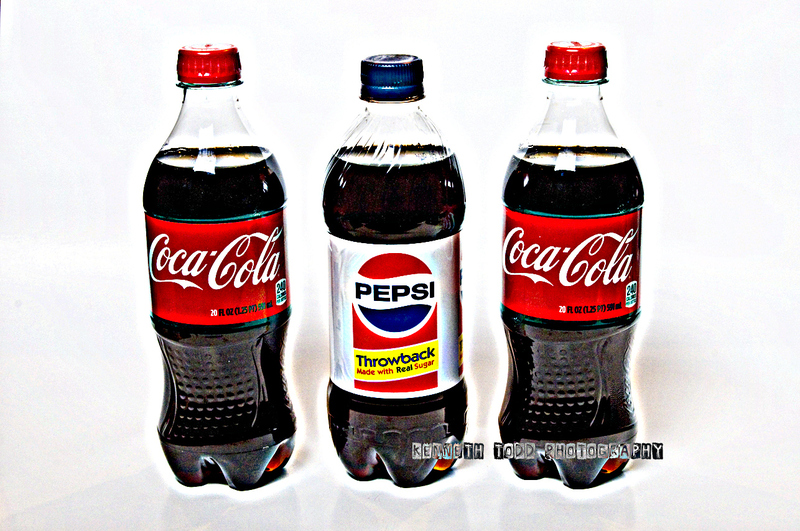 The idea is obviously based on all the debate and rivalry between Coke and Pepsi and which tastes better. I say, if you’re thirsty just drink it. Or even better, drink water, sorry Coke and Pepsi (they do sell water too), but it is better for you….Us humans like to judge everything, good or bad, right or wrong, too fat too thin, this needs to change, he needs to change, blah blah. See it as it is, nothing more. Don’t judge it, don’t criticize it, just accept it. If you don’t like it, choose something else. Easy as. No need to label it or judge it. Finally, I added an HDR type tone mapping to this, just to spice it up from regular vanilla type white backing shots. Remember all images on this site are copyright protected. Thanks Phil and your blog is fantastic too, although I can’t quite write like you. So I throw in a photo and phrase here and there…Tks again. Take care.